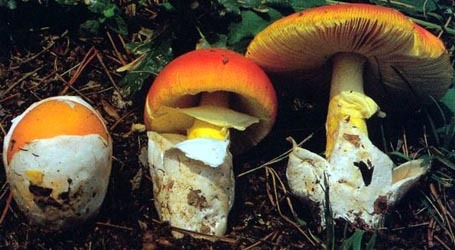 english name "Great Funnel-Veil Amanita"
3. 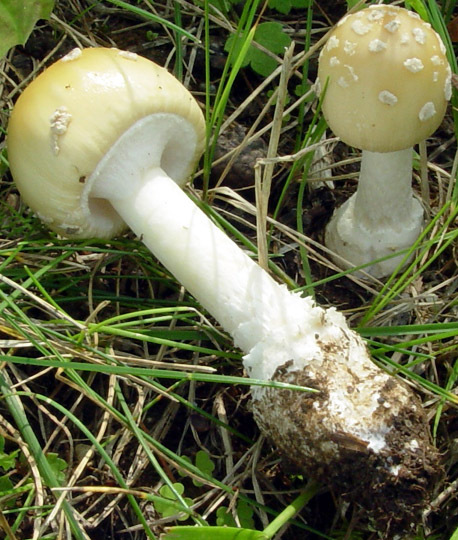 Amanita velatipes, Brookland Cemetery, South Waldoboro, Knox Co., Maine, U.S.A.
4. Amanita velatipes, Thompson Pond Preserve, Pine Plains, Dutchess Co., New York, U.S.A.
intro Amanita velatipes is a rather large species of the northeastern U.S.A. and southeastern Canada. cap Its cap colors are often close to yellowish cream. The volva is usually distributed on the 80 - 120 mm wide cap as white warts. gills The gills are free, crowded, and white to pale cream. stem The stipe is up to 170 × 20 mm, has an interesting (often submedian) annulus that is pulled up into a funnel shape by the expansion of the mushroom, and has a volva that leaves a robust rolled rim around the top of the basal bulb. spores According to Jenkins (1986) the spores measure 7.9 - 13.2 × 6.3 - 7.9 µm and are broadly ellipsoid to ellipsoid to elongate and inamyloid. Clamps are rarely found at bases of basidia. discussion Fruiting bodies of this species can be quite large—the larger of the "buttons" in the accompanying illustration was nearly as big as RET's fist. The species is associated primarily with Oaks (Quercus) and conifers. author G. F. Atk. 1900. Studies Amer. Fungi: 63, figs. 64-67. ≡Venenarius velatipes (G. F. Atk.) Murrill. 1913. Mycologia 5: 75. 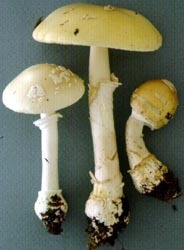 ≡Amanita pantherina var. velatipes (G. F. Atk.) Dav. T. Jenkins. 1977. Biblioth. Mycol. 57: 72.
neotypifications Jenkins. 1977. op. cit. : 72.
type studies Jenkins. 1977. op. cit. : 98. Jenkins. 1982. Mycotaxon 14: 245. The following macroscopic description is largely based on the protolog and the annotation deposited with the Bills collection at BPI. Microscopic detail comes from cited sources or (where citation is lacking) from original research of R. E. Tulloss. pileus 80 - 120 mm wide, buff or Buff Yellow (2.5Y 8.0/7.0) or Maize Yellow (2.5Y 8.5/6.0) or Hair Brown (10YR 4.4/1.0) or umbrinous brown [sometimes with tinge of Lemon Yellow (7.5Y 8.0/10.5)], with brownest tones over disc, often becoming cream color in age when predominantly yellow at first, subglobose at first, then convex, finally planar, viscid when moist; context ? ; margin striate (?-0.5R), nonappendiculate; universal veil in warts and flat patches, often elongate (at least at first) in direction perpendicular to pileus radius, white to cream, with edges becoming upturned, detersile; pileipellis easily separable at margin. lamellae free, crowded, white to pale cream, about 10 mm broad at midpoint, tapering thence to extremities; lamellulae ??. 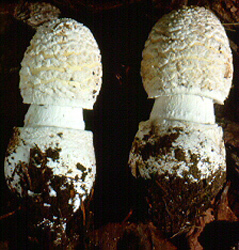 stipe up to 170 × 10 - 20, white to cream, with brownish yellow stains in age, longitudinally striate, fibrous to floccose-scaly, cylindric or narrowing upward slightly; bulb globose to napiform; context ?, stuffed at first with loose cottony fibrils, becoming hollow; partial veil membranous, skirt-like, often opening upward at first, submedian to inferior; universal veil ocreate, with limb well separated from stipe, thick, white, at top of bulb, occasionally with additional ring of material on stipe above limb. from type study of Jenkins (1982): [-/-/1] 7.9 - 9.4 × 5.5 - 6.3 μm, (Q = 1.25 - 1.71; Q' = 1.42), hyaline, thin-walled inamyloid, broadly ellipsoid to ellipsoid to elongate, often adaxially flattened; apiculus sublateral, cylindric; contents guttulate; color in deposit not recorded. Composite of data from all specimens reviewed by RET & CRC: [121/6/6] (6.0-) 8.0 - 10.5 (-11.5) × (4.5-) 5.5 - 7.2 (-7.8) μm, (L = (6.9-) 8.9 - 10.1 μm; L' = 9.2 μm; W = (5.1-) 5.9 - 6.8 μm; W' = 6.4 μm; Q = (1.13-) 1.28 - 1.62 (-1.73); Q = 1.35 - 1.51; Q' = 1.44), hyaline, colorless, smooth, thin-walled, inamyloid, broadly ellipsoid to ellipsoid, often adaxially flattened; apiculus sublateral, cylindric; contents predominantly monoguttulate; color in deposit not recorded. ecology Subgregarious to gregarious. New Jersey: At ca. 210 m elev. In dominantly deciduous forest including Fagus grandifolia, Betula alleghaniensis, Acer, and some Quercus with understory including Cornus and Viburnum acerifolia. North Carolina: At ca. 1030 m elev. West Virginia: in mixed forest with Tsuga canadensis, Betula alleghaniensis, and Rhododendron sp. material examined Jenkins (1982): U.S.A.: NEW YORK—Unkn. Co. - Cayuga Lk. Basin, 28.vii.1897 Hasselbring 3167 (neotype, CUP-A). RET: CANADA: ONTARIO—Bruce Co. - Albemarle Twp. 11.ix.1988 J. R. Parkin s.n. [Tullos 9-11-88-ONT1] (RET 004-5). U.S.A.: MASSACHUSETTS—Berkshire Co. - Adams, 15.viii.1986 M. A. King & RET 8-15-86-D (RET 002-6). MICHIGAN—Lapeer Co. - Metamora-Hadley St. Recreation Area [42.94° N/ 83.35° W, 280-315 m], 15.viii.2011 Sandy Sheine s.n. [Tulloss SS4] (RET 489-6, nrITS seq'd.). McComb Co. - Shelby Twp., ca. Washington, Stony Creek Metropolitan Pk. [42.73° N/ 83.07° W, 250-260 m], 30-31.viii.2011 Sandy Sheine s.n. [Tulloss SS5] (RET 489-2). NEW JERSEY—Morris Co. - Mendham, Meadowood Twp. Pk. [40°47'31" N/ 74°38'43" W, 214 m], 22.vii.1984 S. Hopkins, A. Gerenday, J. Richards, & R. E. Tulloss [Tulloss] 7-22-84-C (RET 008-5). NEW YORK—Dutchess Co. - Pine Plains, Thompson Pond Preserve, 13.viii.2011 Wm. Bakaitis s.n. (RET 494-6). Madison Co. - unkn. loc., 8.vii.2010 Eric Smith s.n. [www.mushroomobserver.org #48272] (RET 482-4, nrITS seq'd.). Monroe Co. - Rochester, 26.vii.1988 Leo J. Tanghe s.n. [Tulloss 7-26-88-LJT1] (RET 244-10). Tompkins Co. - Ithaca, 9.viii.1981 Samuel S. Ristich s.n. [Tulloss 8-9-81-SSR] (RET 339-7). NORTH CAROLINA—Macon Co. - Nantahala Nat. For., Standing Indian Campground, tr. opposite Lower Ridge Tr. [35.0786° N/ 83.5319° W, 1029 m], 10.vii.1990 R. E. Baird & Scott Gorden s.n. [Tulloss 7-10-90-H] (in herb. Carmine Lavorato, Zurich; RET 025-1). PENNSYLVANIA—Luzerne Co. - Moon Lake Park [41.2530° N/ 76.0470° W, 240-400 m], 3.vii.2015 David Wasilewski s.n. [mushroomobserver #138818] (RET 551-1, nrITS seq'd.). VERMONT—Bennington Co. - Bennington, 23.viii.1980 unkn. coll. s.n. [Tulloss 8-23-80-A] (RET ???-??). WEST VIRGINIA—Webster Co. - Cranberry River, 9.vii.1981 Gerald Bills 101 (BPI). discussion The smallest (and narrowest) spores were encountered in Tulloss 7-10-90-H, which was immature when dried—even in the 20% of the gill length closest to the stipe, basidia were predominantly sterile. MAINE—Cumberland Co. - Cumberland Center, 22.vii.1984 S. S. Ristich 7-22-84-SSRA (RET 113-7); Cumberland Center, Rte. 9, 25.vii.1984 S. S. Ristich 7-25-84-SSRA (RET 207-1), 28.vii.1984 S. S. Ristich 7-28-84-SSRA (RET 207-2); North Yarmouth, 5.viii.1990 S. S. Ristich s.n. [Tulloss 8-5-90-SSR1] (RET 477-5). [67/3/3] (8.1-) 8.5 - 10.5 (-12.1) × (6.3-) 6.6 - 8.2 (-10.5) μm, (L = 9.1 - 9.6 μm; L' = 9.4 μm; W - 7.1 - 7.7 μm; W' = 7.3 μm; Q = (1.10-) 1.13 - 1.46 (-1.51); Q = 1.19 - 1.34; Q' = 1.30). 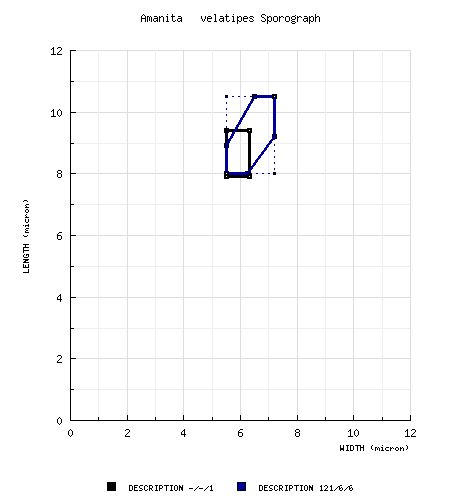 We note that spore length hardly differs on average from spore length seen in the material determined with greater confidence to be A. velatipes. The sample size is small in both groupings. Also, neither group has been thoroughly evaluated anatomically. William Bakaitis - (3) Brookland Cemetery, South Waldoboro, Knox Co., Maine, U.S.A.
(4) Thompson Pond Preserve, Pine Plains, Dutchess County, New York, U.S.A.
provisionally identified as: Amanita velatipes G. F. Atk. select a collection to review/add spore measurements..#821362. S. Hopkins, A. Gerenday, J. Richards, & R. E. Tulloss, #s.n.=>Tulloss, ..#821363. Wm. Bakaitis, #s.n., U.S.A., NEW YORK, Dutchess Co., Pine Plains, Thomp..#821364. Eric Smith, #s.n.=>www.mushroomobserver.org # 48272#821365. Leo J. Tanghe, #s.n.=>Tulloss 7-26-88-LJT1, U.S.A., NEW YORK, Monroe Co..#821366. Samuel S. Ristich, #s.n.=>Tulloss 8-9-81-SSR, U.S.A., NEW YORK, Tompkin..#821367. R. E. Baird & Scott Gorden, #s.n.=>Tulloss 7-10-90-H, U.S.A., NORTH CAR..#821368. unkn. coll., #s.n.=>Tulloss 8-23-80-A, U.S.A., VERMONT, Bennington Co.,..#821369. Gerald Bills, #101, U.S.A., WEST VIRGINIA, Webster Co., Cranberry River..#821391. M. A. King, #& RET 8-15-86-D, U.S.A., MASSACHUSETTS, Berkshire Co., Ada..#821392. Sandy Sheine, #s.n.=>Tulloss SS4, U.S.A., MICHIGAN, Lapeer Co., Metamor..#821393. Sandy Sheine, #s.n.=>Tulloss SS5, U.S.A., MICHIGAN, McComb Co., Shelby ..#821403. J. R. Parkin, #s.n.=>Tullos 9-11-88-ONT1, CANADA, ONTARIO, Bruce Co., A..#821405. Sandy Sheine, #s.n.=>Tulloss SS4, U.S.A., MICHIGAN, Lapeer Co., Metamor..#831932. Sandy Sheine, #s.n.=>Tulloss SS4, U.S.A., MICHIGAN, Lapeer Co., Metamor..#831933. Sandy Sheine, #s.n.=>Tulloss SS5, U.S.A., MICHIGAN, McComb Co., Shelby..#831934. S. Hopkins, A. Gerenday, J. Richards, & R. E. Tulloss, #s.n.=>Tulloss,..#831939. R. E. Baird & Scott Gorden s.n. , #s.n.=>Tulloss 7-10-90-H, U.S.A., NO..#831940. David Wasilewski s.n. , #s.n.=>mushroomobserver # 138818#831943. Hasselbring, #3167, U.S.A., NEW YORK, Unkn. Co., Cayuga Lake Basin#831944. J. R. Parkin, #s.n.=>Tullos 9-11-88-ONT1, CANADA, ONTARIO, Bruce Co., A..#831945. M. A. King & RET 8-15-86-D , #s.n., U.S.A., MASSACHUSETTS, Berkshire C..#831946. Sandy Sheine, #s.n.=>Tulloss SS4, U.S.A., MICHIGAN, Lapeer Co., Metamor..#831947. Sandy Sheine, #s.n.=>Tulloss SS5, U.S.A., MICHIGAN, McComb Co., Shelby..#831948. S. Hopkins, A. Gerenday, J. Richards, & R. E. Tulloss, #s.n.=>Tulloss,..#831949. Wm. Bakaitis, #s.n., U.S.A., NEW YORK, Dutchess Co., Pine Plains, Thom..#831950. Eric Smith s.n. , #s.n.=>www.mushroomobserver.org # 48272#831951. Leo J. Tanghe, #s.n.=>Tulloss 7-26-88-LJT1, U.S.A., NEW YORK, Monroe C..#831952. Samuel S. Ristich, #s.n.=>Tulloss 8-9-81-SSR, U.S.A., NEW YORK, Tompki..#831953. R. E. Baird & Scott Gorden s.n. , #s.n.=>Tulloss 7-10-90-H, U.S.A., NO..#831954. David Wasilewski s.n. , #s.n.=>mushroomobserver # 138818#831955. unkn. coll. s.n. , #s.n.=>Tulloss 8-23-80-A, U.S.A., VERMONT, Benningt..#831956. Gerald Bills, #101, U.S.A., WEST VIRGINIA, Webster Co., Cranberry Rive..